Ever since NASA’s Cassini spacecraft arrived in Saturn’s neighborhood more than 10 years ago, it has been sending back groundbreaking images and data about the planet in the outer solar system famous for its rings, as well as its many moons. But all missions eventually come to an end. Cassini has embarked on its “Grand Finale,” the final leg of its journey that is bringing it on dives between Saturn and its rings and on other final sweeps of the area before it finally runs out of fuel and NASA sends it into Saturn’s atmosphere to burn up in a fiery sendoff. Until that final salute in September, and as Cassini takes whatever measurements and other data it can during the time it has left, we can reflect on its most exciting discoveries of Saturn and its moons. Here are some of the most important images it has sent back to Earth. Saturn has plenty of full-sized moons orbiting it, but apparently they are not enough. Scientists have discovered that its massive rings have tiny moons — adorably called “moonlets” — cutting through them as they swing around the planet. The moonlets displace material in the rings during their orbits, with their gravity creating waves in the dust that forms the rings and creating propeller-shaped gaps in the rings wherever they are. 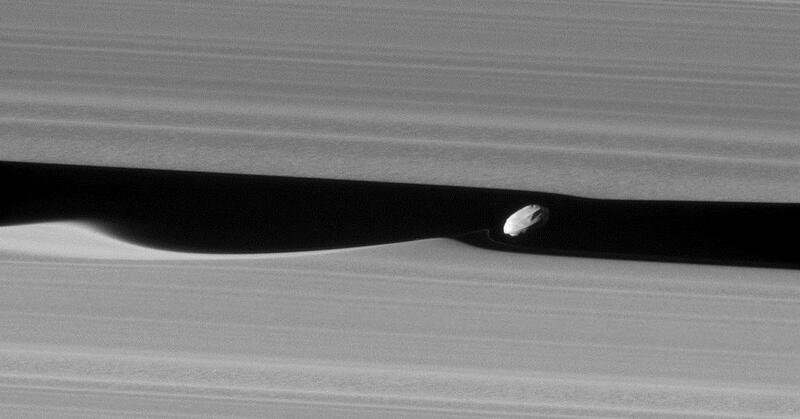 Cassini got plenty of closeups of these propellers, but arguably the most powerful of its moonlet images is the strikingly clear closeup of Daphnis, a 5-mile-long moonlet streaking through the outer edges of the planet’s rings. The Cassini spacecraft has gotten up close and personal with Saturn’s moon Enceladus during its journey to the outer solar system, including inspecting plumes that come off the moon’s surface. 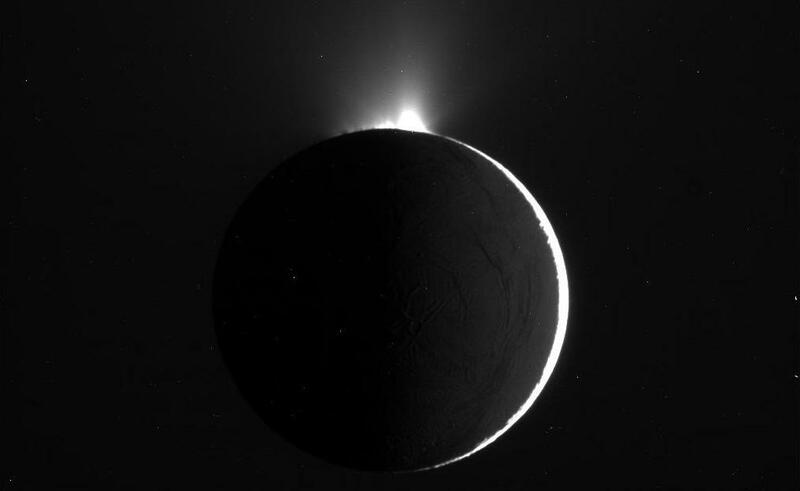 This shot of the plumes backlit by the sun show them shooting off Enceladus. Cassini flew through the plumes for the first time and collected data to send back to Earth around the time this picture was taken. Over time scientists have analyzed all the data from Cassini to find that Enceladus has hydrogen, which could be an energy source for certain kinds of alien life forms. 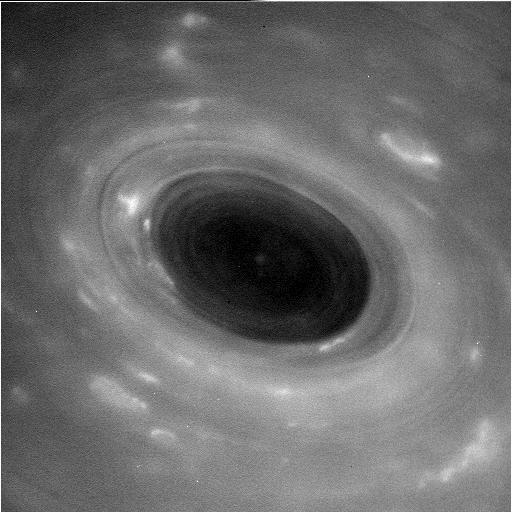 Cassini went in April where no one had gone before: into the gap between Saturn and its rings. The spacecraft caught some tight shots of Saturn’s atmosphere during its dive, the first of almost two dozen planned for the Grand Finale. The first was the most dangerous, as scientists weren’t completely sure what to expect. But now that Cassini survived the journey and sent back some stunning photos and data from the trip, it paved the way for future dives. 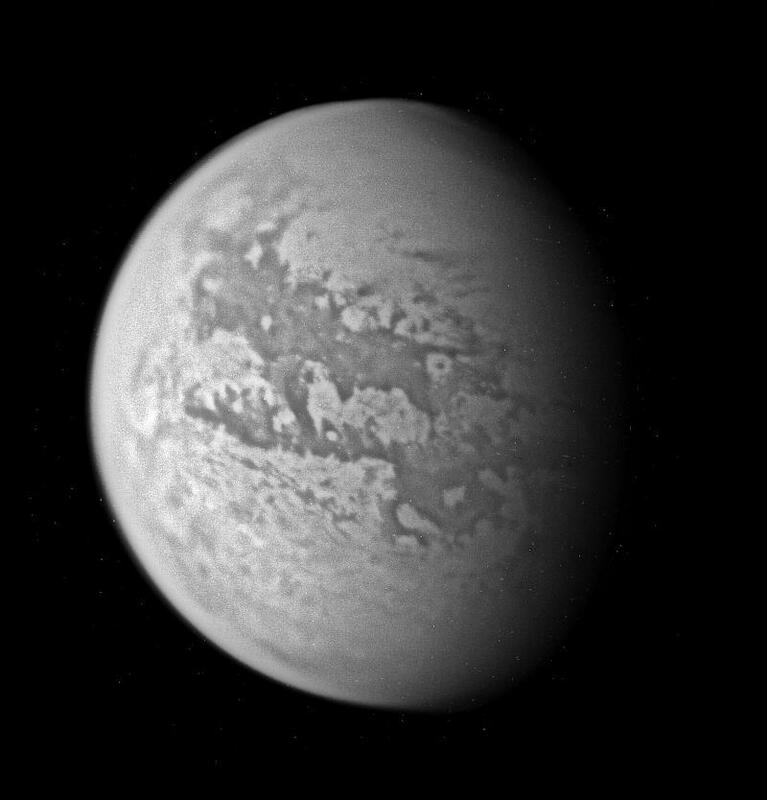 The spacecraft might be famous, but it has not forgotten where it came from. 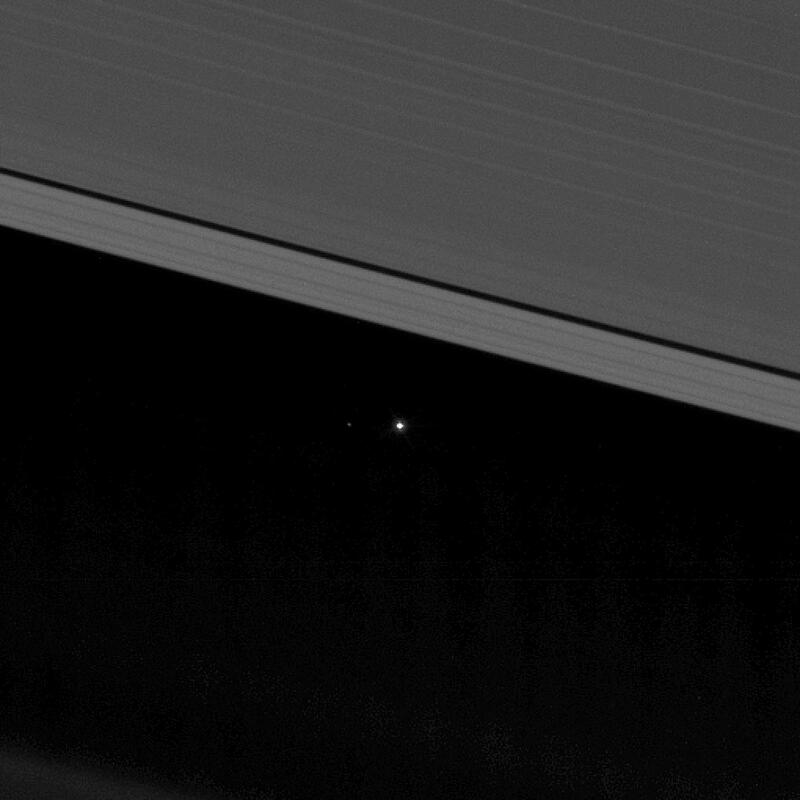 Cassini recently sent back an image it took while peering through Saturn’s rings: one that shows Earth and Earth’s moon shining like stars in the distance. Although the photo doesn’t tell us anything groundbreaking about our planet, it is an interesting view. Some may find it humbling to see how small and nondescript Earth looks from a planet in the outer solar system, while others may find it powerful that Earth can be spotted from such a distance away in the universe. Cassini once made a clever move of using Saturn to block the intense light of the sun and then snapped a photo from behind the giant planet, capturing its illuminated rings in all their glory. According to NASA, it was a view scientists had never had before. And it included some familiar faces: A trained eye can detect the “pale dot of Earth” above the bright main rings as well as the moon Enceladus.